The Lower Dolpo trek lies in far western part of Nepal in The Shey-Phoksundo National Park. 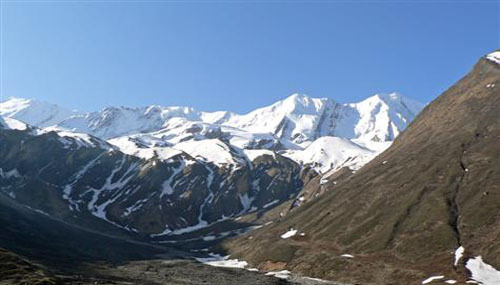 This trek is in restricted area and a special permit is needed to trek here. The trek is a hard one so you need to be physically strong. The focal point of the trek is the Shey Phoksundo National Park, a remote, rugged and protected area with fantastic scenery and a wealth of fascinating ancient cultures. The park is home to some extremely rare animals and plants not found anywhere else in the country. Basically the trek is to travel a circuit with the focal points being Shey Phoksundo lake and the Tarap valley. Just east of Tarakot the trail swings north to follow the Tarap Valley for two days crossing and re crossing the Tarap Khola (river) before reaching Dho Tarap. This valley contains many old relics of religious significance with many Bonpo (a religion that pre dates Buddhism) and Buddhist temples. Dho Tarap (4000 mtrs) is an ideal location to spend some time. Magars and Gurungs mostly inhabit the flat upper valley floor along with the Tibetans they share the valley with. From Dho Tarap two high passes must be climbed over in order to reach Ringmo and Phoksundo Lake. The crossing can be made in two days but may need to be extended if there are unfavourable weather conditions. Day 22 : Fly from Juphal to Nepalgunj and again fly from Nepalgunj to Kathmandu. Day 01 : Fly from Kathmandu –Nepalganj. Day 04 : Dunai – Hanke check post. Day 08 : Shey – Phoksundo Lake – Baga La Base Camp. Day 20 : NepalGunj – Kathmandu By flight.